I would like to devote today’s post to HMS Bounty, lost at sea today off the North Carolina coastline when it encountered hurricane Sandy en route from Connecticut to Florida. As of the time of this post, 14 of sixteen crew members have been rescued by the coast guard, and two are still missing. UPDATE: Another survivor was found, unresponsive. Bounty’s Captain is still missing. Please send your hopes/prayers/thoughts for his safe rescue. HMS Bounty was built in 1960 at at Smith and Ruhland Shipyard in Lunenburg, Nova Scotia, as a replica of the original HMS Armed Vessel Bounty (originally the coal ship Bethia, built in 1787) commanded by Lieutenant William Bligh. Fletcher Christian, Bligh’s sailing master, led a mutiny on board, taking control of the ship on April 28, 1789. Bligh and those loyal to him were cast off in the ship’s boat and after 47 days and more than 3,500 nautical miles, made it to the Dutch port, Coupang. The mutineers, in fear of being apprehended by the Royal Navy, dropped several men in Tahiti, and then, (according to a crewman’s diary) sailed without warning with several Tahitian women and men still on board, to Pitcairn Island, where they burned Bounty to erase any trace of her. 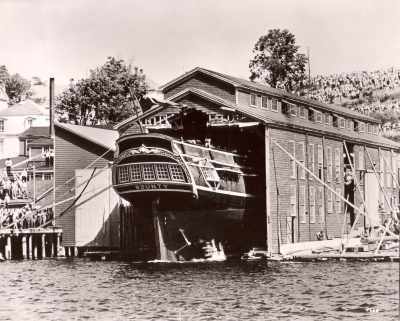 The replica ship, HMS Bounty, was originally built for the movie Mutiny on the Bounty, starring Marlon Brando, Trevor Howard, and Richard Harris. It was built from the original Royal Navy plans, but sized up 30% to hold camera equipment and the movie crew, in addition to the regular crew. After filming, and a tour with MGM, Bounty became a tourist attraction in St. Petersburg, Florida until 1986. She was then purchased by Ted Turner and used to film Treasure Island, starring Charleton Heston, donated, and finally purchased in 2001 by HMS Bounty Organization, and was refitted and refurbished for a voyage around the world. Since then she has been used to teach square rigged sailing and seamanship. It is difficult to describe what the loss of this vessel means. She was a physical, real, connection to our not-so-distant history, and to understanding innovations and knowledge of craftsmanship that are still very much at the heart of everything we engineer. We build vehicles to take us places, to explore, to look at a horizon and then to find out what’s beyond it. A ship is literally a traveling reflection of our attitude toward the environment and ourselves. If we build ourselves as individuals and as a community with foresight and attention, as works of art that are also shelter and home, we can last a long time, contained by something we are proud of. The forces that power us- wind and time- will also eventually sink us, but while we are alive and sailing, it should be in our best form. So yesterday I promised to help us all avoid future humiliation when hanging out with sailors: what to call his or her vessel, or more importantly, what not to call it. So the first distinction: boat or ship? Though there is argument about the particulars, there seem to be two main determinants: size and range. Ships are larger: hence, you can carry a boat on your ship, but you can’t carry a ship on your boat, well, unless you have one of those ships in a bottle in your boat, but come on, this is very serious. Ships are bigger than boats, which is not a comment about power, I mean a tugboat can push/pull a cargo ship out of the harbor. This is not a size contest, ok? Sheesh. Which is where the second determinant comes in: range. Boats are designed to stay near land, while ships are built to cross oceans. But of course it’s not that simple. Now add masts and sails, and you have a whole new world of ships, barques, barkentines, brigs, brigantines, and sloops, oh and yawls, ketches, schooners, cutters and snows, caravels and something called a freedom. When I first saw this chart, I thought, “Hooray!” But I was also that kid who liked to spend saturday morning watching cartoons and memorizing cat and horse breeds from one of those encylopaedic books. So I fully understand that “Hooray!” is not going to be the typical response to this chart. So, because I like you and want you to continue on this journey with me, I’ve provided crib notes below. *square sails hang on yards that are perpendicular to the mast, and are rigged perpendicular to the keel of the vessel. ** fore-and-aft sails are triangular, and are rigged parallel to the keel of the vessel. **the long, triangular sails (jibs) hung on the bow do not count, only sails on the masts. ****although sometimes, with a topsail schooner, just the upper part of the foremast is square-rigged. Don’t give up! Ships are like the English language: there seem to be more complications and exceptions than rules. There is always that silent e that makes the vowels go long, but seriously the music of language and the music of ships is totally worth getting it wrong. 1. 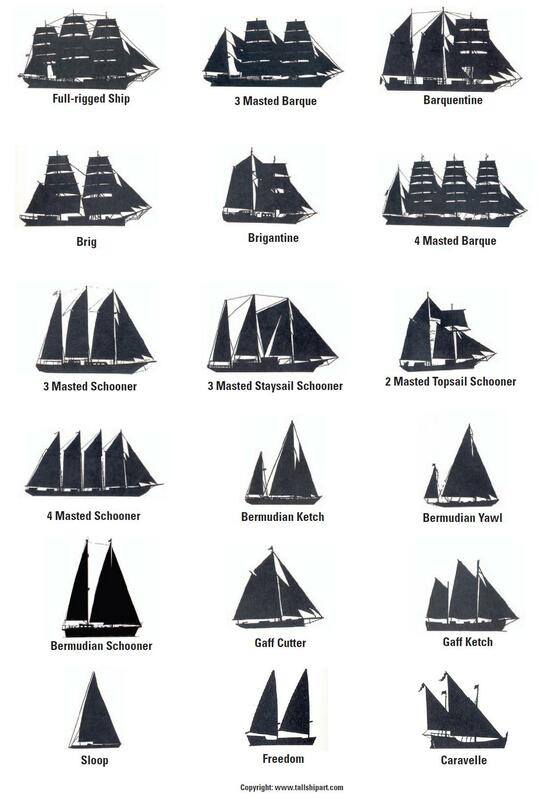 A true “ship” has three or more masts, and they are all square-rigged. (#1 above). 2. If it has three or more masts, all square-rigged, except the last mast is rigged fore-and aft, you have a barque/bark). (#2 above). 3. If it has three or more masts, but only the first mast is square rigged, and the rest are fore-and-aft, you have a barquentine (barkentine). This is what we’re sailing the Arctic Circle on! (#3 above). 1. If you have one mast that is square rigged, you have a disaster. 2. If you have one mast that is fore-and-aft rigged, you have a sloop. (#16 above). I fully expect (and deserve) to now be schooled by you die-hard sailors out there.